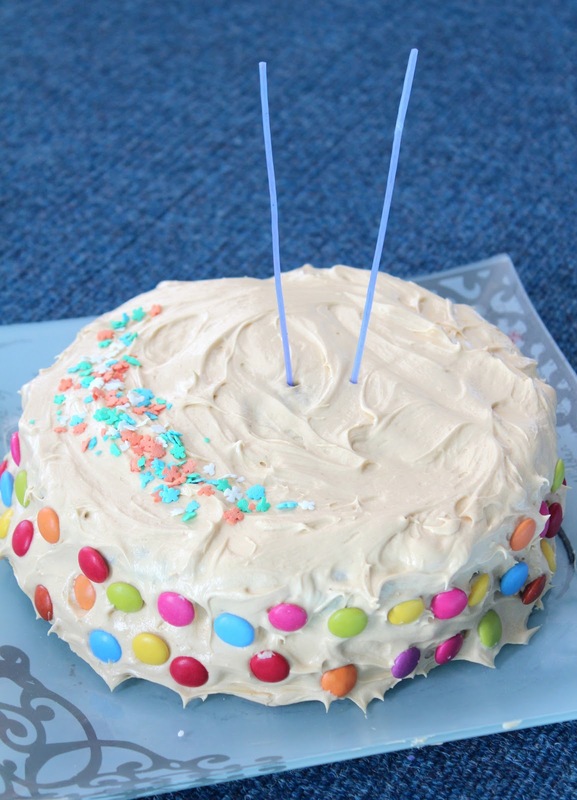 Want an easy yet impressive birthday cake? This is the one for you. I made this for my roommate who turned 20 yesterday. I am aware that it is decorated kind of like a kid's cake but we're all struggling with the fact that we are now expected to be pretty much adults all the time and so I figured a bit of peanut butter and messy frosting and M&Ms would help us all forget that Von is the first of us three roommates to hit this milestone (the rest of my friends are already 20 or will be within the next month). This cake also helped me deal with finishing Arrested Development (has anyone else seen season four yet?). 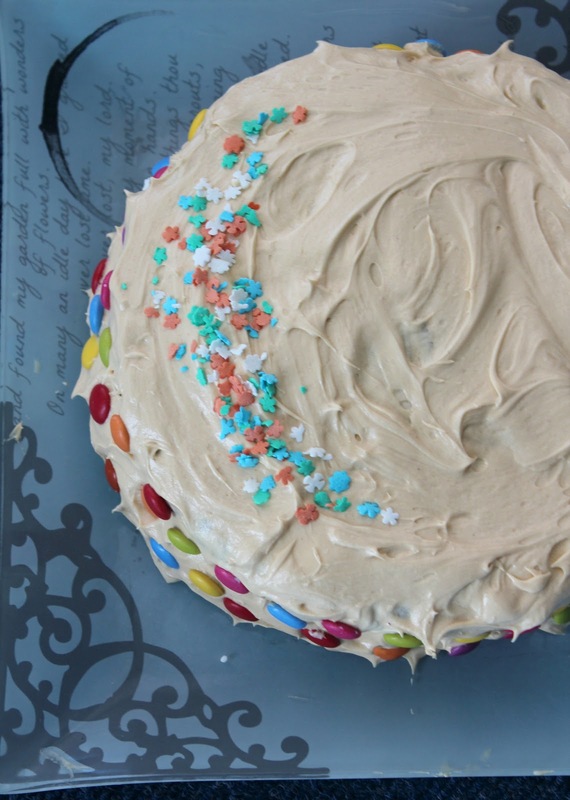 This is a deceptively easy cake to make. It does not require extraordinary time or effort to make. 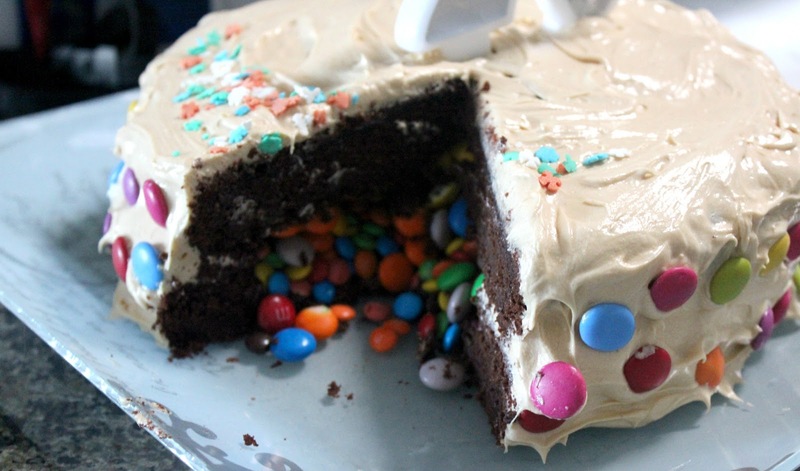 It is easily adaptable to your favourite cake and frosting recipe, which means you can eat a cake you know you will love and enjoy the look of surprise on someones face when they cut into the cake and realise it is a pinata. It's really a lot of fun. 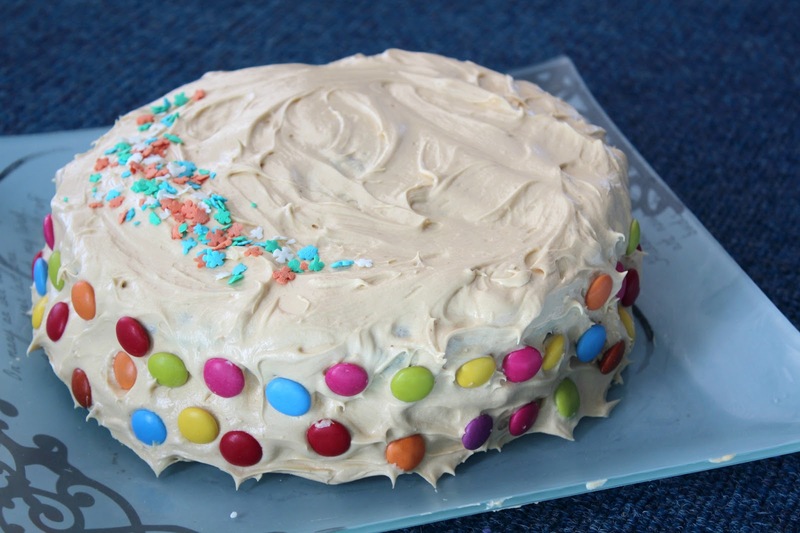 Cake mix / your favourite cake recipe - you need to make two cakes, so whatever cake mix or recipe you chose, make sure you can get two cakes out of it. I used Annie's Eats Chocolate Peanut Butter Layer Cake recipe and baked it in two 10 inch tins. The choice of tin is up to you - a more rounded cake tin would work better in this instance, but regular shaped tins also work well. Additionally, make sure that whatever recipe you chose, the cake is rich - a light and fluffy cake will fall apart when sticking the two cakes together - you need a 'strong' cake, for lack of a better word. Frosting - again, you need a decent amount of frosting, so make sure whatever recipe you chose (I would chose a thick buttercream-style recipe) it can cover two cakes - either double the recipe or use a recipe designed for layer cakes. You may have some leftover. I used the amazing peanut butter frosting from the recipe above. My advice would even be to use the recipe above - the cake held up well and was deliciously rich, while the frosting was sweet and stuck nicely to the cake. I also love the chocolate and peanut butter combination and would definitely recommend trying it. Bake the cakes. Do as recipe says. Allow to cool completely before moving on to the next step. Cut a large circle out of the top of one cake. Using a spoon, scoop out the cake inside that circle, being careful not to cut through to the bottom or sides of the cake. Therefore you should be left with one cake completely in tact and the other with a large hole in. 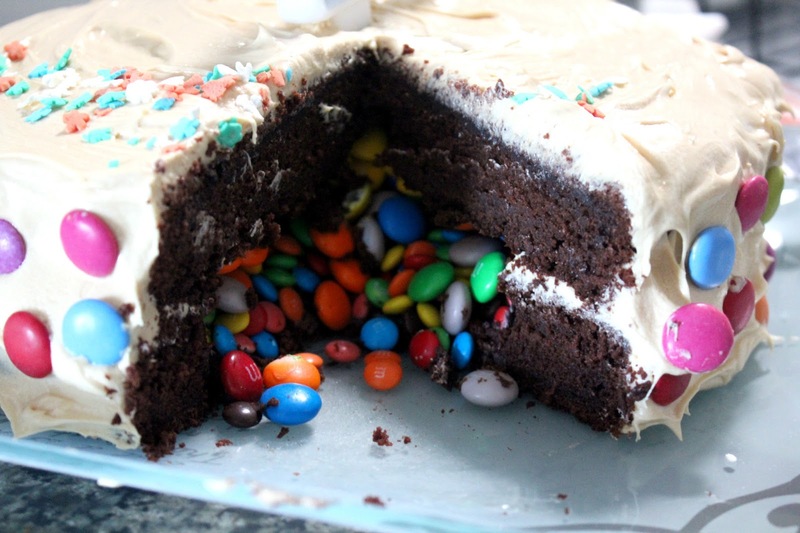 Fill the hole with chocolate and candy - whatever you choose. I filled mine with a variety of M&Ms. Make the frosting as per the recipe. Frost the top of the cake with the hole first. By this, I mean simply frost the outer layer of the hole. Next, frost the top of the other cake. Very carefully flip the in tact cake upside down, so that the frosted top of the cake is facing the floor. Carefully place this cake on top of the hole cap, effectively sealing the candy in between the two cakes. Using the remaining frosting, frost the rest of the cake, doing both the top and sides of the cake. This will ensure that candy is trapped in the cake and no one will know it is a secret layer cake. Finally, using whatever you chose, decorate the outside of the cake. 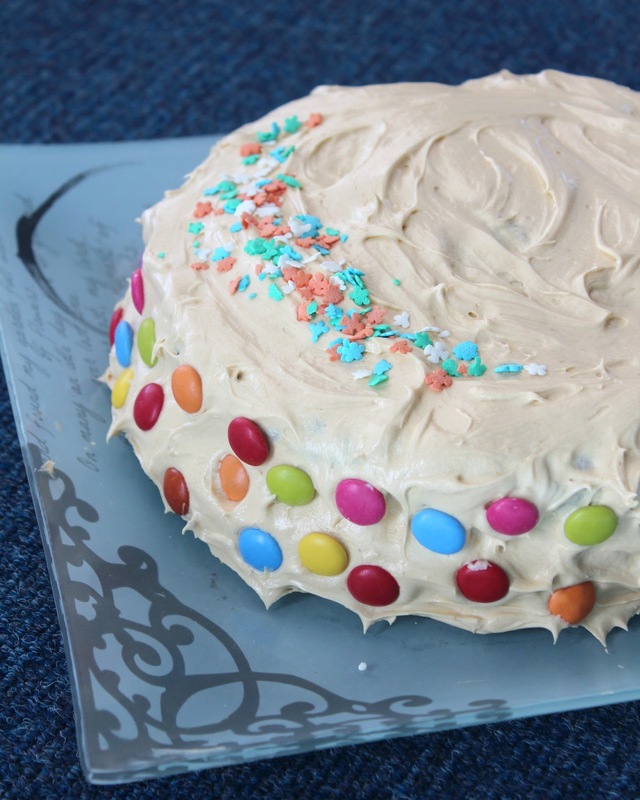 I used smarties (found in Australia and prettier than M&Ms) and some sprinkles. You use what you chose. Place in fridge until ready to serve. Take out a few minutes before serving so the inside candy is not cold but not until the frosting starts to melt. 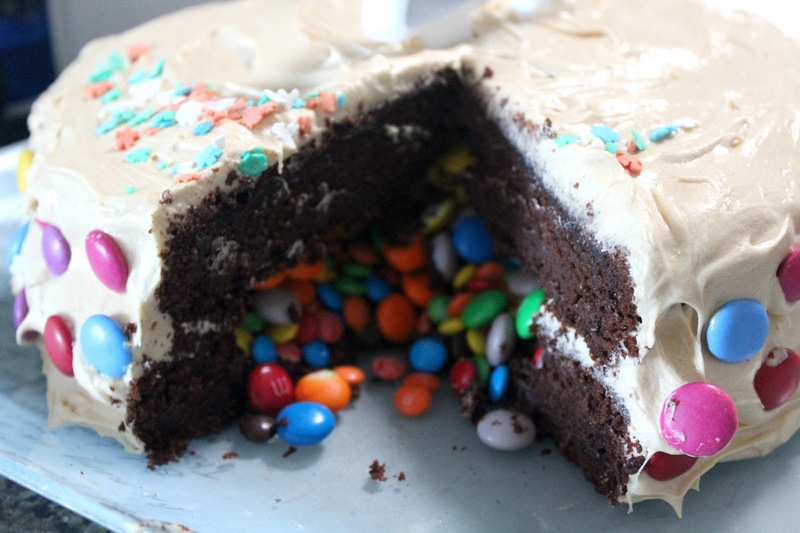 When you cut into the cake, the candy trapped in between the two layers will fall out, like a pinata. Wow this cake looks so festive and fun, love it! I can't believe you made this, I always see it on pinterest and think wow so cool! I wouldn't mind getting a cake like that for my birthday, even my 24th ;) Looks amazing!